Eriosyce robusta var. cabildensis hort. Accepted Scientific Name: Eriosyce curvispina var. robusta (F.Ritter) Katt. Origin and Habitat: Maule (VII región) to Choapa (IV Región) in the north. Ocoa, Pichidangui, (Parque Nacional La campana, Reserva Mundial de la Biósfera) Type locality: Valparaíso. Habitat: Rocky outcrop on costal terraces and cliffs. Eriosyce curvispina (Bertero ex Colla) Katt. 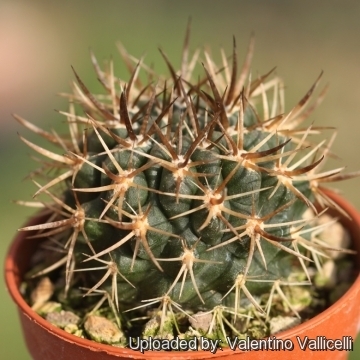 Horridocactus curvispinus (Bertero ex Colla) Backeb. Echinocactus pachycentrus Lehm. ex Pfeiff. Eriosyce curvispina var. choapensis (F.Ritter) Katt. Neoporteria jussieui var. dimorpha (F.Ritter) A.E.Hoffm. Horridocactus kesselringianus var. subaequalis Backeb. Horridocactus aconcaguensis var. orientalis (F.Ritter) Backeb. Pyrrhocactus mammillarioides var. pachycentrus (Lehm.) Backeb. Neoporteria horrida var. coliguayensis (F.Ritter) A.E.Hoffm. Pyrrhocactus horridus (J.Rémy ex Gay) Backeb. Horridocactus horridus (J.Rémy ex Gay) Backeb. Chilenia jussieui (Monv. ex Salm-Dyck) Backeb. Echinocactus centeterius Lehm. ex Pfeiff. Eriosyce curvispina var. aconcaguensis (F.Ritter) Katt. Eriosyce curvispina subs. armata (F.Ritter) Katt. Eriosyce curvispina var. armata (F.Ritter) Katt. Neoporteria horrida var. armata (F.Ritter) A.E.Hoffm. Neoporteria horrida var. limariensis (F.Ritter) A.E.Hoffm. Horridocactus marksianus var. tunensis (F.Ritter) Backeb. Neoporteria curvispina var. marksiana (F.Ritter) A.E.Hoffm. Eriosyce marksiana var. gracilis (F.Ritter) Katt. Horridocactus lissocarpus var. gracilis (F.Ritter) Backeb. Eriosyce marksiana var. lissocarpa (F.Ritter) Katt. Eriosyce curvispina var. mutabilis (F.Ritter) Katt. Neoporteria horrida var. odoriflora (F.Ritter) A.E.Hoffm. Eriosyce curvispina var. robusta (F.Ritter) Katt. Neochilenia robusta var. vegasana (F.Ritter) Backeb. Eriosyce curvispina subs. tuberisulcata (Jacobi) Katt. Eriosyce curvispina var. tuberisulcata (Jacobi) Katt. Description: Eriosyce robusta var. cabildensis is a spherical plants usually solitary characterized by relatively short but very strong and thick spines. It is one of the the innumerable form of Eriosyce curvipina which is among of the most wide-spread of the Eriosyce species. Plants belonging to this taxon have robust tan-brown spines. Stem: Globular, up to 15 cm. 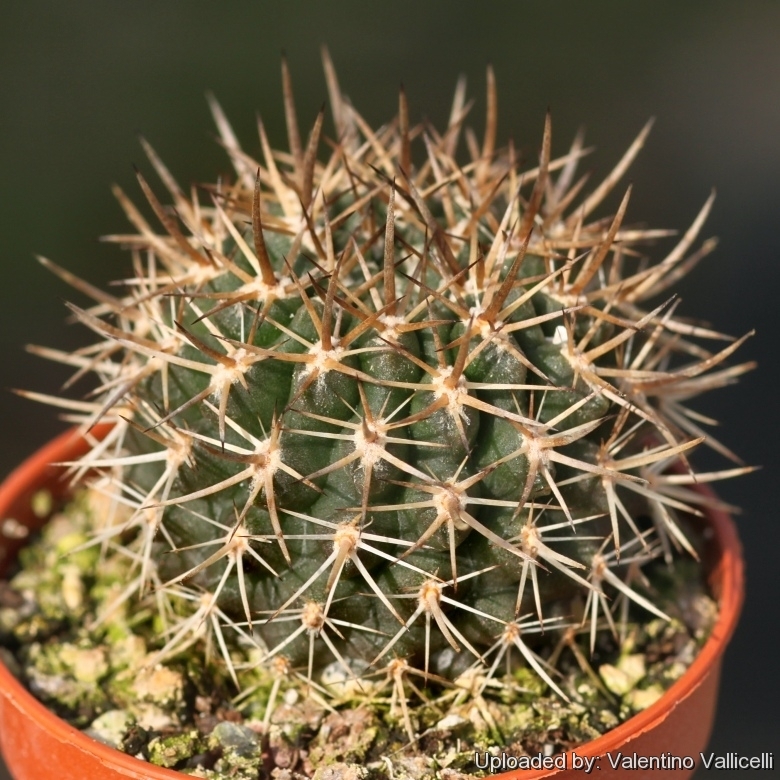 Spines: Short but very strong and thick, stiff dull amber-brown to tan coloured whit darker tip, young spines are brownish while older one became greyish. Eriosyce curvispina (Bertero ex Colla) Katt. : (var. curvispina) stem solitary with strongly curved spines more than 20 mm long. Flowers to 5,5 cm in diameter. Distribution: widespread throughout the range of the species. Eriosyce curvispina var. aconcaguensis (F.Ritter) Katt. : always solitary with strongly curved spines and pure yellow flowers. Stem 4,5 cm in diameter. Distribution: Cuesta Las Chacras, north of Llaillay. Eriosyce curvispina subs. armata (F.Ritter) Katt. : is similar to variety aconcaguensis differs only for the yellow flowers with deep red midveins. Distribution: south and west of Santiago. Eriosyce curvispina var. choapensis (F.Ritter) Katt. : has shor but strongly curved spines only 10-15 mm long. Distribution: Valley of the Rio Choapa. Eriosyce curvispina var. mutabilis (F.Ritter) Katt. : forms clusters. Distribution: endemic Punto Pichidangui. Eriosyce curvispina var. robusta (F.Ritter) Katt. : stem solitary. Flowers have much elongated pericarpels. Distribution: Ocoa. Eriosyce curvispina subs. tuberisulcata (Jacobi) Katt. : has straight, very robust spines and nearly red flowers. Distribution: Laguna Verde and adjacent areas, South of Valparaiso, Chile. Eriosyce robusta var. cabildensis hort. : has robust tan-brown spines. Distribution: Cabildo, Chile. Pyrrhocactus curvispinus var. santiagoensis: not dissimilar to var. curvispina. Distribution: Aconcagua valley, East of Santiago. Cultivation and Propagation: It is a summer grower species. Easy to cultivate but somewhat rot prone if kept in a non ventilated place. Require a very fast draining drying soil, water regularly in summer, but do not over-water.